Training people to excel in their chosen profession has evolved over recent years. Developing people is like completing a jigsaw puzzle with skills and product training being only part of the picture. To make people fully effective also requires ‘personal development’ in key areas such as confidence, attitude and self-motivation. Without this combined approach, the picture is incomplete and the training will never achieve its full potential. 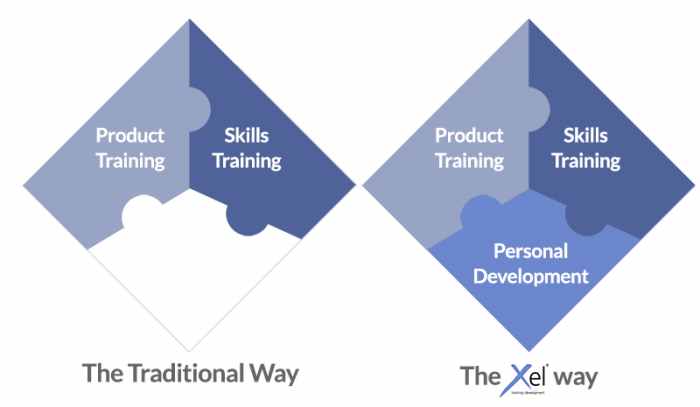 Unlike traditional training methods, Xel’s integrated range of Master Classes, coaching and consultancy services take a more scientific and structured approach to personal development. Our approach is a complete educational process that can be underpinned with nationally recognised qualifications. How many of these factors are important to you when selecting a training provider? Very few businesses buy training on the basis of lowest price. They’re looking for performance improvement. They look for the BEST because they want their people to be the BEST. They look for the BEST VALUE FOR MONEY. Post-training products and services to refresh and reinforce the training and coaching message. Highly practical training based on proven most successful ways of doing the job. Customers want to see results from their training investment NOW. We focus on the fastest possible results. One-day Master Classes that minimise time away from the workplace. A full refund if you are not satisfied. Prestigious venues, high quality manuals and a framed attendance certificate: our delegates are treated as VIPs. Carefully selected, specially designed and equipped training suites provide the ideal learning environment. Training without inspiration is rarely effective. Xel offers a highly skilled and experienced team to train and coach delegates throughout the UK. Get a taster for what we offer. Few training providers offer this. We do. Customers can book training, tailored to their specific requirements, on a date and in a venue exclusively for their organisation. Your Training Director will contact you to check the progress of every delegate and provide ongoing help and advice on future training needs. Every delegate assessment form is on file; every testimonial letter received from a customer – all open for inspection. ISO9001 and Investors In People: tangible evidence of our total commitment to quality. City & Guilds and Institute of Leadership & Management qualifications are provided as part of our structured training programmes where required. Every delegate assessment form and testimonial letter is kept on file and all are open for inspection.